Convincing government organisations to fully adopt the cloud isn't easy. In 2013, the UK Government announced that it had adopted a ‘Cloud First’ policy for public sector IT. The advisory policy, which asserts a commitment to adopting cloud-based IT services ahead of other solutions, was a response to a failure from the UK public sector to tap into the flexibility, efficiency, and cost savings of cloud services. With legacy IT systems becoming a drain of public funding, which is being squeezed further year on year, Cloud First was designed to ensure that cloud services are considered the first option when making IT purchasing decisions. The primary aims were to realise cost savings and operational efficiencies, free up public money for services such as health and social care, leisure facilities and culture, and pave the way for the UK’s ambitions to have a world-class digital infrastructure by 2020. Five years later, cloud adoption in the UK public sector has unquestionably risen, with 2017 research conducted by Cloud Industry Forum finding that 82% of public sector organisations have deployed at least one cloud service. The same study, however, described adoption as “more shallow than deep.” Obstacles such as lacking the budget to move applications to the cloud, an unwillingness to take risks, and a lack of skills were all cited as reasons for cloud adoption being more piecemeal than the figures suggest at face value. Migrating typically virtualised applications such as email to the cloud is one thing, but when it comes to migrating databases, file servers, and CRM systems, which require more heavy-lifting and change management, there is significant progress to be made. So, how do you address the concerns of public sector regarding cloud adoption? 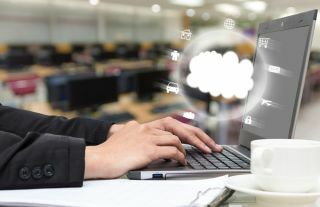 A TechUK report called Cloud First: Policy not Aspiration suggests that 50% of civil servants do not feel comfortable using the cloud, with over three quarters citing data security concerns as a key barrier to adoption. If perceptions still exist that cloud migrations are hard work and long-winded, there will always be resistance. While G-Cloud makes selecting and purchasing cloud services easier, public sector organisations and personnel may require further education in terms of getting the cloud up and running, and training on how to maintain and upgrade their services. As well as having the right support in place, the cloud solutions themselves must be easy-to-use to encourage widespread adoption. Solutions which are managed through an intuitive web standard-based interface, and do not require specific coding and development skills or costly hardware installations are preferable in the majority of cases. These are challenges which G-Cloud’s network of approved partners and suppliers can support public sector organisations with. Research from Eduserv earlier this year surveying 373 local councils found that local authorities do understand the merits of the cloud, so the key to increasing adoption may lie in tackling cultural barriers, skills shortages, and insufficient budgets. Rather than a lack of understanding, one of the key barriers to adoption is cultural inertia – a reluctance to make strategic investments in new technology which is fit-for-purpose, easier to maintain and costs less to run. Rather than force feed the benefits to public sector organisations, the government and cloud industry should create platforms for technology evangelists to spread the word of their own successes and give advice on overcoming cultural barriers. Establishing a change culture within the UK public sector has the potential to be the greatest driver of adopting modern technologies. The 2018 Eduserv research found that the IT approach at a regional level is very much a hybrid one. However, some authorities are still using systems which were installed in the 1990s as concerns exist around perceived high up-front investment and not possessing the skills required to use modern cloud-based systems. This should be taken as a key learning by stakeholders. Cloud adoption does not necessarily mean moving entire IT provisions into the public cloud. The hybrid approach can allay fears around highly sensitive data being stored offsite, demands a less radical cultural change from IT departments and users, while significantly increasing the flexibility and scalability of the IT infrastructure. Rolling out proof-of-concepts and migrating applications to the cloud one-by-one, proving that the long-term gain outweighs the short-term pain, is a way of on-boarding different areas of the organisation. This can alleviate the feeling of resistance to adoption and the perception of forced cultural change, leading employees and departments to feel that the migration is happening on their terms. The modus operandi of Cloud First is that considering cloud services as a first option is policy not aspiration. However, the idea that cloud adoption can be driven through making it more prominent in IT purchasing decisions is flawed. It assumes that IT departments are investing in their infrastructure at all and that there is always an appetite to move away from legacy systems which cost the organisation money and are difficult to manage. It is not just public sector businesses which suffer from inertia. Withdrawing support for legacy systems feels like the best way to force organisations’ hands. However, research from Spiceworks found that four years after support for Microsoft XP was ended, 52% of businesses were still running on the popular enterprise operating system (OS). So, stricter regulation of IT spending may be required to ensure that public money is not being frittered away on outdated systems and that a significant percentage is invested in fit-for-purpose, future-proof, cloud-based infrastructure. As well as discussing the cost-savings to the IT department that cloud enables, to encourage wider cloud adoption, the Cloud First initiative should be positioned to local authorities as a driver that can free up money to provide more and better public services. For example, digitisation of public information and migration to the cloud could free up budget to invest in new public facilities, improvements to public infrastructure and local cultural initiatives. Another way to position the cloud is to point out that it can provide a platform to enable better innovation for other technological services. For example, local healthcare authorities may be able to invest further in medical technologies that allow them to provide better patient screening services and analyse data more quickly. This, in turn, could relieve pressure on the local NHS Clinical Commissioning Group, which many would agree is a desirable outcome of investment in public services. Local councils, on the other hand, may wish to provide better waste disposal services for their constituents, which entails gathering and understanding the data on usage of waste disposal and recycling services at both a micro and macro level. Technologies such as the Internet of Things (IoT) and Artificial Intelligence (AI) are crucial to this process, and processing data in the cloud means that IT departments and data analysts can spend more time planning and optimising local services. In conclusion, the UK Government cannot rely on simply enforcing its Cloud First policy if it hopes to drag public sector organisations into the 21st century. The barriers which are stopping investment at a local level despite the well-received and obvious benefits of modern cloud technology must be addressed in full before the UK can reap the rewards of a world-class digital infrastructure.